Shouldn’t You Be Using An Access Control System? In this day and age there are countless reasons why you wouldn’t want everyone to have the freedom of entry into your office building, school, or residential complex. With no means of knowing who is coming and going, both staff and residents are likely to feel unsafe. While you may feel a traditional lock up and key set up is perfectly alright for your small office, many businesses of all types and size are finding there are many benefits associated with an access control system. So first of all what exactly is access control? Basically, it’s just a means of restricting control to certain areas of a building, using electronic means. This can include entry doors into a building, certain rooms within the building, and even external perimeter gates. For example a business may require a restricted room to hold personal files and other sensitive information. An access control system would mean the business could limit access to certain people only. Many business may contain equipment and goods which have a street value. It’s bad enough to learn that someone from inside has been stealing from you, and even worse when you realise you’ve allowed them easy access. An access control system keeps track of who has arrived and when they leave, by logging an entry every time access is gained. Businesses with a large amount of employees and temporary staff can find it difficult to keep track of who should be inside the building and who shouldn’t. An access control system stops strangers from getting through your doors. Entering a building perhaps early in the morning when it’s dark can be a little intimidating especially if you have to fumble around for your keys in you cot pocket or handbag. A security card is much quicker to swipe and can’t be duplicated easily like a set of keys can. When an employee leaves you need to make sure they hand back any keys that they have in their possession and even then, there’s no knowing if they could have had copies made. Failure to do so could mean a company having to change their locks or get new keys made. With an access control system a card can be easily removed from the system when an employee leaves the business and a new card issued when necessary. 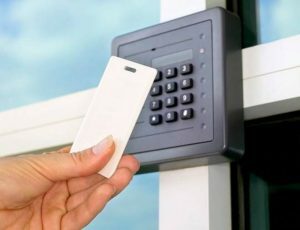 In the event that your business have more than one building or location, an access control system can be used to limit access to those personnel who only need access to one building and allow access to those personnel who need to be able to move freely across all company buildings and locations. If you’re interested in an access control system for your business then get in touch with MA Security. We’ve got experience of access control systems and can fit one to suit your particular needs and requirements. Call us today on 1300 020 406 to see how we can help you.